Egypt's communication ministry contracted Samsung to supply one million educational tablets for the 2018-2019 academic year at a cost of EGP 2.4 billion, sources told Al Mal on Sunday. According to the sources, the education ministry received offers from seven international technological companies to supply the required tablets before settling on Samsung, according to the Minister of Education Tarek Shawky. The price per tablet is expected to not exceed $80 (EGP 1400). Sources added that Samsung will deliver the educational tablets to the ministry of education in the coming days to be used in the upcoming academic year by first year secondary education students. The introduction of tablets to the education process will incentivize students to not be absent from school, as teachers will be required to register the absence of each student electronically with a maximum number of missing days allowed for each student until they are prohibited from receiving the exam electronically on the tablet, according to Shawky. Egypt's Minister of Communications, Amr Talaat, previously said that the ministry is willing to be more involved in the production of electronics in order to supply the tablets domestically next year, in cooperation with the ministry of military production, the Arab Organization for Industrialization, and other companies, according to Al Mal. Egypt has been trying to modernize its teaching techniques through a new educational system that the country will be placing into test in the next academic year. In an official statement by the ministry of education on Friday, kindergarten and first year primary teachers took part in constructive training to prepare them for the new educational system that will come into action in the upcoming academic year. The minister of education explained that the new educational reforms passed last April are based on digital learning and removing curricula and test methods that depend mainly on memorization as a step to "build the Egyptian person". Of the educational policies, thanaweya amma reform seems to be the focal point. Thanaweya amma exams are going digital so that students will receive their exams electronically based at their schools without having one unique national exam, removing the significance of private lessons which target structured answers to their respective questions, according to the minister. Tests will be sent to students' tablets to be answered electronically under an "open-book" style, and will be corrected electronically and anonymously, Shawky said. In addition to that, the high school cumulative grade will depend not just on the last year, but on all three years of secondary education. Students will be required to complete 12 exams during the three high school years, and 6 of them have to be passed successfully to proceed to university education. 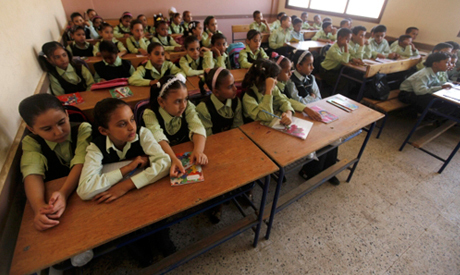 Egypt received a $500 million loan last April from World Bank to support teacher training and a potential technology-based educational system in Egypt.